Note: We've updated our periodic look at the Philly Fed ADS Index today's release, which includes unemployment claims through December 15. 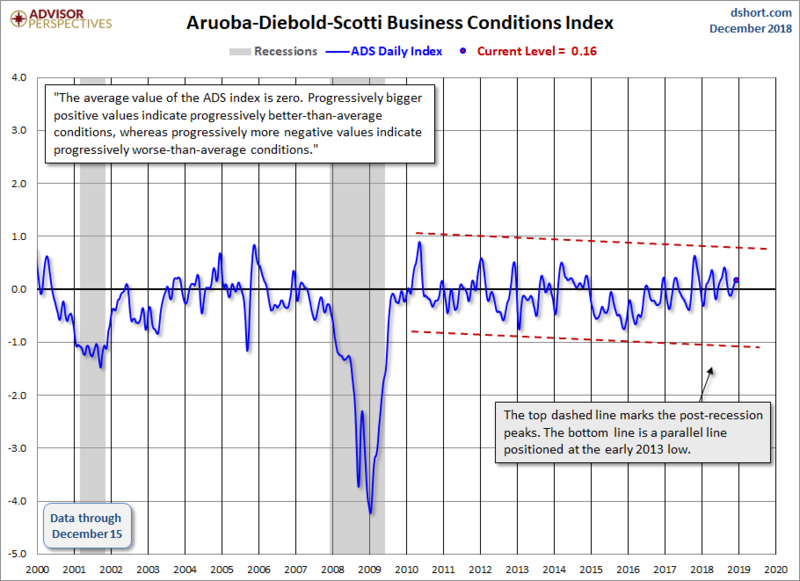 The Philly Fed's Aruoba-Diebold-Scotti Business Conditions Index (hereafter the ADS index) is a fascinating but relatively little known real-time indicator of business conditions for the U.S. economy, not just the Third Federal Reserve District, which covers eastern Pennsylvania, southern New Jersey, and Delaware. Thus it is comparable to the better-known Chicago Fed's National Activity Index (more about the comparison below). Named for the three economists who devised it, the index, as described on its homepage, "is designed to track real business conditions at high frequency." The accompanying commentary goes on to explain that "The average value of the ADS index is zero. Progressively bigger positive values indicate progressively better-than-average conditions, whereas progressively more negative values indicate progressively worse-than-average conditions." The first chart shows the complete data series, which stretches back to 1960. We've highlighted recessions and the current level of this daily index through its latest data point. Now let's take a closer look at the 21st-century daily index. We've added a pair of dashed parallel lines highlighting a high-low channel since 2010. Our purpose was to give a better sense of direction for the economy. The top dashed line marks the post-recession peaks. The bottom line is parallel to it and positioned at the early 2013 low. The recent interim lows have been trending higher. The chart below features a 91-day moving average of this daily index. Why 91 days? The better know cousin index of the Philly Fed's ADS the Chicago Fed's National Activity Index. The CFNAI is updated monthly, but the metric that gets the most attention by the Chicago Fed economists is its three-month moving average. They've even coined an acronym for it, the CFNAI-MA3. Thus we've used 91 days as a comparable smoothing of the Philly Fed ADS index. 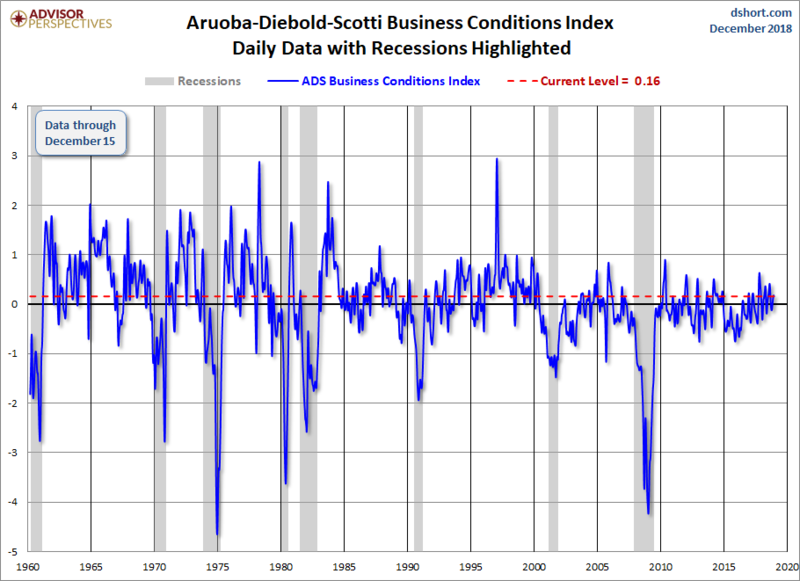 In the ADS 91-day MMA chart below we've highlighted recessions and the value of the smoothed index at recession starts.